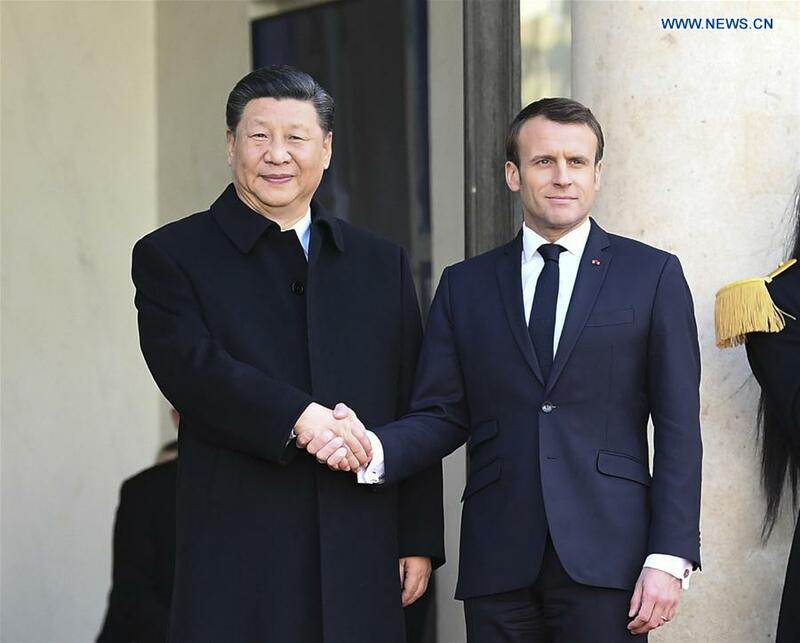 The Chinese president proposed that in order to develop the relations between China and France in a sound way, the two countries should have political mutual trust, practical cooperation and friendly sentiments between the two peoples. "Under the new situation, the two sides should do much better in those three aspects, and continue to explore the way for major countries to get along with each other, which should feature independence, mutual understanding, foresight, mutual benefit and win-win outcomes," Xi said. "In politics, we should not only build a strong 'dam' of mutual trust, but also a 'lighthouse' of ideal," he said. He suggested that the two countries deepen communication and exchanges in an all-round way and on various levels, fully leverage the roles of all institutional dialogues, and increase the exchanges between governments, legislative bodies, political parties and armed forces. The two sides should insist on respecting and accommodating each other's core interests and major concerns, pursue harmony in diversity, and seek common ground while reserving differences, Xi said. He urged the two countries to strengthen cooperation under the United Nations (UN), the Group of 20 and other multilateral frameworks, push for the implementation of the Paris agreement on climate change and the 2030 Agenda for Sustainable Development, take practical action to safeguard multilateral trading regime and uphold the basic norms governing international relations as underpinned by the purposes and principles of the UN Charter. On practical cooperation between China and France, Xi said the two countries should not only explore the "source of flowing water" in market, but also facilitate the "river channels" in policies. The two sides should deepen cooperation in nuclear energy, aviation, aerospace and other traditional sectors, and expedite cooperation in emerging areas including scientific and technological innovation, agriculture, finance and elderly care, Xi said. President Macron has on many occasions expressed the willingness of carrying out practical cooperation with China on the Belt and Road Initiative (BRI), which China appreciates, Xi said, adding that the two sides need to earnestly implement the BRI-related demonstration projects in third-party markets. He asked the two countries to provide more support and convenience for bilateral trade and investment. "We welcome more French businesses to invest and develop in China, and in the meantime, we hope the French side offers fair, open and non-discrimination treatment for Chinese businesses to invest in France," Xi said. The two countries should fully use the China-France high-level people-to-people and cultural exchange mechanism, and promote cooperation in culture, tourism, language, youths and at local level, he said. Xi also asked the two countries to well organize the commemorative activities on the 55th anniversary of China-France diplomatic ties and the 100th anniversary of the Chinese Work-Study Movement in France, and to host a culture and tourism year in each other's country in 2021. Calling China and the European Union (EU) two major forces, markets and civilizations of today's world, Xi said China attaches importance to Europe's strategic status and role, and has always regarded deepening China-EU relations as a diplomatic priority. China supports France in continuing to play a leading role in the process of Europe's uniting for self-improvement, and hopes France exerts a more positive influence in pushing forward China-EU ties, Xi said. The Chinese president also urged both sides to accelerate the negotiations on a China-EU investment treaty, and initiate a joint feasibility study on the China-EU free trade agreement at an early date.